Be sure to sign-up and schedule your hours the first week of classes! *If needed you can make-up SSP hours Mondays-Thursdays, 3-7pm or Fridays, 5-8pm (just remember there will be no Writing Consultants or Math Tutors available at those times). The Structured Study Program or SSP is managed by Student Academic Support Services in coordination with Athletics. The goal of SSP is to provide arranged and organized study time for Defiance College students involved in athletics, as well as, any student in need of academic structure. SSP promotes learning by encouraging students to set academic goals for their SSP sessions. SSP also creates an environment where students can get coursework done free of distractions and where students can get the academic assistance they need to improve study skills. Sessions are offered throughout the week and must be scheduled online. Please see Lisa Crumit-Hancock, Director of Student Academic Support Services (Pilgrim Library Room 216) or Brandon Ripke, Academic Support Coordinator (Pilgrim Library Room 217), if you have any questions. Link to Defender article about SSP...thanks Zack Bires! You must sign up for SSP hours the first weeks of the semester using the online sign-up form to the left. You schedule these hours just like you schedule your class and are expected to keep those hours unless you have a conflict due to athletic competition, faculty meeting, or club/organization activity. When you come into the library for your SSP hours, please go to the information desk and surrender your DC student ID. This will be used to clock you in and be kept until you clock out. You will also need to sign the attendance roster. If you are doing a makeup, please sign AND indicate the reason you missed your regularly scheduled hour(s). All students in SSP will sit in the designated area of the library - upstairs. NO student clocked in for SSP should be on the lower level of the library. Students must come prepared to study. Students need to bring appropriate coursework: reading, writing assignments, projects, etc. Therefore, plan appropriately by bringing all books and supplies needed for the SSP session. If a student is in need of assistance, they can ask at the information desk or talk to Brandon Ripke (room 217) or Lisa Crumit-Hancock (room 216), whose offices are across from the information desk. Technology is to be used for academic purposes only! This includes but is not limited to cell phones and computers. Do not bring these items to Structured Study unless a legitimate academic purpose for using them is apparent. DO NOT WATCH GAME FILM OR OTHER FRIVOLOUS VIDEOS ON YOUR COMPUTER OR THE LIBRARY'S COMPUTERS! 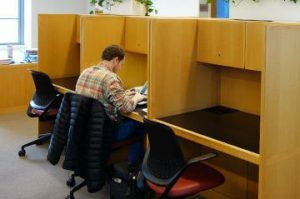 There will be a limited number of computers available for your academic use. These computers are only for academic use and you will be asked to get off if you are using them for non-academic purposes (this includes viewing athletic film!). Occasionally, the Library Computer Lab is reserved and may not be available during your SSP session, please plan accordingly. No food from the cafe or hive as well as any outside establishment is allowed during SSP. You may have a bottle of water or other beverage with a cap or a light snack. The use of tobacco in any form is prohibited in the library as well as on campus. No alcohol is allowed in the library. The library and SASS staff reserve the right to dismiss any student if they deem any action/behavior inappropriate or a violation of the SSP rules or the student handbook rules. If you are asked to leave, this will be reported to your coach or other DC personnel and you are required to see Lisa Crumit-Hancock within the next 24 hours. You will not be allowed back into SSP unless verification is obtained from Lisa.